Is Avoiding Left Turns Worth It? You turn your blinker on and then you wait. You try to figure out the perfect time to make your turn without getting hit. You don’t want to take any chances, but you also don’t want to make the person behind you mad. Taking an unprotected left turn is one of the most stressful moves a driver has to make, with good reason. According to the National Highway Traffic Safety Administration, 26% of all accidents have to do with someone making a turn. Think about it, you have to try to judge if you have enough time to make a turn with the pressure of others waiting for you. It can be challenging to judge how fast a car is going or how far away it is, especially at night. According to How We Drive, left-hand turns also require a substantially higher amount of brainpower versus right-hand turns. So if you are talking on your phone (even hands free) or to a passenger or singing to music, you aren’t fully focused on the task at hand. Not only are left turns risky business, they are also a giant waste of time. So much so, that back in 2004, the United Parcel Service (UPS) rerouted their trucks to avoid having to take left-hand turns. The result: they have saved a whopping 10 million gallons of gas since. Their packages were delivered quicker and a lot of money and time was saved. Well, I can’t just avoid left-hand turns. Or can you? UPS proved that even if the distance was a little farther to only make right-hand turns, time was still saved. It might be worth double-checking your route. 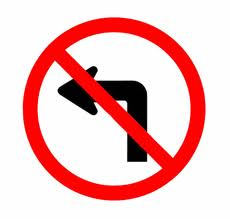 If you do have to make unprotected left-hand turns, you need to follow a few simple steps. Take your time. Don’t worry about the people behind you, even if you are making them mad because you are taking too long. They will live, but if you aren’t careful, you may not. Only go if you are 100% confident you have time. Seriously. It’s not worth the risk. Drive defensively. Always. Be aware of everything around you. If a car has a blinker on, wait for it to actually turn before you start to. Check for pedestrians. Make sure you have a clear view of all oncoming traffic lanes before attempting to turn.